Mark Glickman presents on individual performances during "Who Will Win in Rio?," a symposium examining the disparity between the ideals and the reality of the modern Olympic Games. Everyone loves the ideals of the Olympics. But a group of scholars speaking at a Harvard symposium on Friday wondered if today’s Games are living up to their promise of excellence and sportsmanship. Danyel Reiche, a visiting fellow at Harvard’s Institute for Quantitative Social Science and an associate professor for comparative politics at American University of Beirut, convened the symposium, “Who Will Win in Rio?,” with just four weeks until the opening ceremony for the Summer Games in Brazil. Numerous controversies surround the first South American city to host the Olympics, including infrastructure delays, health concerns (Zika virus, water pollution), and security. “Whether the host cities benefit or not, what’s been going on in Rio is extraordinary and tragic,” said Andrew Zimbalist, a professor of economics at Smith College. Calling the International Olympic Committee “out of touch,” Zimbalist, the author of “Circus Maximus: The Economic Gamble Behind Hosting the Olympics and World Cup,” cited the displacement of impoverished Brazilians, the design of a golf course on an environmental reserve, and the development of a subway line from the beach to a wealthy suburb as ill-conceived uses of funds in Rio. 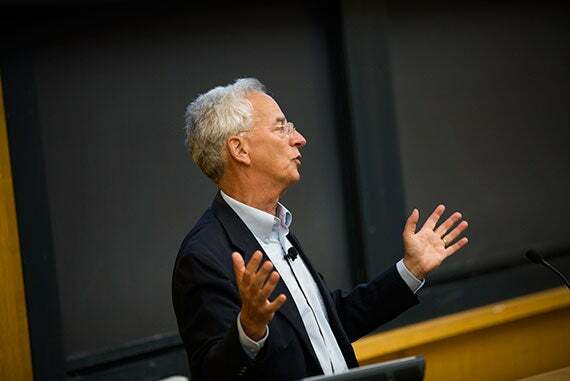 When an audience member suggested the creation of an Olympic Island, Zimbalist agreed that the infrastructure for the event should be developed once instead of every four years. Reiche’s own research on winners and losers has looked at the Games through the lens of medals, in which goals can range from winning at least five (Botswana) to a first-ever gold in soccer (Brazil). The fixation on specific goals has upended the spirit of the Games, he said. Great Britain, for example, dramatically cut funding for basketball after the poor showing in the London games. “The obsession has gone quite far,” said Reiche, who suggested combating the winning-is-everything philosophy by having players from different countries compete together on the same team. The morning conversation also covered research on host-country advantage by Stephen Pettigrew, a doctoral candidate in the Harvard Department of Government, and analysis by researcher Mark Glickman of individual performances. Using women’s beach volleyball as an example, Glickman, the founding head of the Sports Analytics Laboratory in the Department of Statistics, compared the ranking system of the International Volleyball Federation (FIVB) to probabilistic systems (Elo, Glicko, Glicko-2, and Stephenson). The teams of April Ross and Kerri Walsh Jennings (United States) and Talita Antunes and Larissa Franca (Brazil) consistently topped the probabilistic systems, but the latter didn’t appear in the Top 10 of FIVB’s rankings. “The FIVB ranking approach makes no distinction between losing and not competing. From a statistician’s point of view, there’s information on losing that doesn’t get factored into the ranking,” he said of the FIVB rating. Harvard Business School labor economist Gareth Olds discusses new research into the surprising relationship between entrepreneurship and the social safety net.